So Jeff, myself and Jeffrey, our 4 year old set off in the dead of winter on our journey. 24 mostly sleepless hours after we took off from LA, we landed in St Petersburg and we 3 weary travelers headed off to collect our luggage and face the cold. My first up close and personal introduction to a Russian citizen was with the lady in passport control. She glared at me the moment she took my passport and looked at it for a long time before she looked back up at me scowling. "Eeez theez you?" She asked. I immediately felt guilty. Was that me? Who knows after 16 hours on a plane. I just smiled and nodded far too much. She took Jeffy's passport and looked it over with a scowl. She held the passport up to compare the picture to him. She shook her head, mumbled in Russian, stuffed the passports back through the window and informed me that my child was not dressed warmly enough. At this point I wasn't certain if she was going to let me into the country. I dug around in my bag and pulled out his sweatshirt, forced it over his head and assured her that his winter parka was in the luggage. She glared at me, shook her head and motioned for me to continue on. I didn't even realize she had stamped our passports. We somehow managed to bypass the incredibly long line of the "Nothing to declare, green lane" by trying to go through the "Something to declare, red lane". We had a large amount of money to pay our adoption facilitator and were told that we needed to declare it. When we went through the doors of the red lane (where there was no line), a man approached us and asked if we had lost our luggage. I stared at the luggage we were dragging then shook my head. He shrugged his shoulders and ushered us out past all the lanes and into the airport. Still not sure how that happened but looking back on the 200 people still waiting in the green line, we took it as a gift and moved on. We missed Natalya, our translator as we came out the wrong door. We stood waiting near the airport's entrance doors looking lost while she stood at the green lane door waiting for us to come out. She finally caught sight of us, rushed over and presented me with flowers and hugs for everybody. The relief was overwhelming because I had begun to think she just hadn't showed up! We stepped outside into a cold as we 3 Southern Californians had never felt before. Jeffrey was crying by the time we got to the car and trying to hide his face under my shirt. Thanks for the air conditioning kid! After quite a bit of juggling, we somehow got all of us and our luggage into her little car and were off to our hotel. We arrived at our hotel 6 PM local time. That was 5 AM our time and I had not slept more than 2 hours since we left LA over 24 hours before. I was dizzy with exhaustion. Jeff said we should stay up another few hours so we could get a regular nights sleep. He said if we did that we would wake up in the morning and be on Russia time. It was a good idea he said. I'm sure he said more but I had fallen asleep next to Jeffy and missed the rest. The problem with going to sleep at 5:30 AM (LA time) is that your body wakes you up in the middle of the afternoon (LA time) and wonders why you are sleeping and why on earth it is pitch black outside. 2:30 AM Russia time and I'm sitting up in bed wide awake. It wasn't more than 10 minutes before everyone else was awake too. We turned on the lights and began our day. Which consisted of Jeff sitting at our laptop, Jeffy watching DVDS on the portable player and me reading Harry Potter for the next 4 hours while we waited for the breakfast buffet to open up. We were the first ones to arrive and we were starving. We hadn't eaten since the last plane ride more than 12 hours before. Its not so bad when you're asleep and not eating, but when you have to sit for 4 hours thinking about how hungry you, it gets overwhelming. (We weren't aware at this point that we there was a 24 hour mini mart next door where could have picked up some snacks). The food at the buffet was excellent. It definitely had a European flare with fish and Russian pastries, but they had stuff we were used to as well. Eggs, French toast, cereal and fruit. I accidentally poured yogurt (might have been kefir) into a bowl thinking it was milk. (They had it in a pitcher). It took me a little bit to figure out what it was because at first I thought the milk had gone bad. We went back to the room and still had 2 hours until our driver arrived to pick us up. We used the time to unpack then headed downstairs where we found Cathy and her daughter waiting for us. It was great to meet her face to face for the first time. Together we headed out into the cold and straight into the large van they had provided for us to travel back and forth to the orphanage. 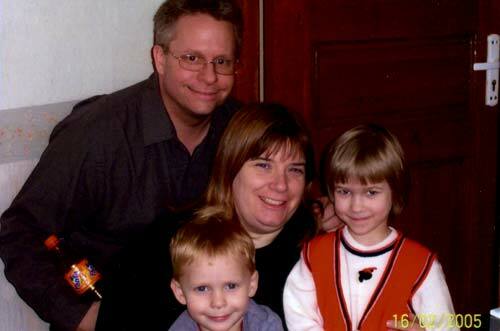 Cathy was traveling with her husband and their 2 teenagers, Brin and Patrick. We all settled into the 14 passenger van and headed off into the city to the MOE (Ministry of Education) where we would receive our official referrals and then off to meet our kids. 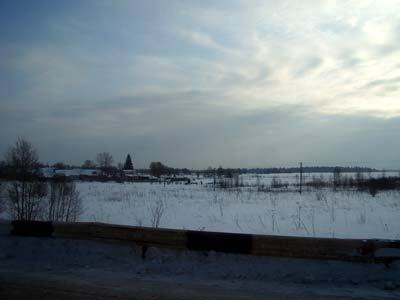 The ride out to the orphanage was 2 hours and through beautiful snow covered countryside. The van was comfortable and afforded lots of good viewing from the big windows. It was also good for sleeping on the way home. So the three of us (Jeff, myself and Jeffrey) set off in the dead of winter on our journey. Finally, countless hours after we took off from LA, we landed in St Petersburg Russia. The lady in passport control glared at me the moment I stepped up to the window. She snatched my passport out of my hand and looked at it for a long time before she looked me, one eyebrow raised. "Eeez theez you?" I immediately felt guilty. Was that me? Who knows after 16 hours on a plane with a 4 year old. I certainly didn't feel like myself. Or maybe this was a trick question. I couldn't think straight and I stood there with my eyebrows knitted together and one eye twitching. She shoved the passport back across the counter and snatched Jeffrey's from my other hand. She held the passport up to compare the picture to him. She scowled even more deeply and informed me that "Your child eez not dressed to go outside... Eeeez that how you 'ave dressed him for this terrible cold?". I grabbed his sweatshirt from my bag, yanked it over his head and assured her that his winter parka was in the luggage. She shook her head, shoved his passport back over the counter and motioned for me to get out of her sight. With that fun out of the way we met our translator Natalya (the first friendly face since we landed) near the airport's entrance doors. She presented me with flowers and hugs. We stepped outside and immediately froze to death. By the time we got to the car Jeffrey was trying to climb under my shirt. We discovered that we had 1/2 ton of luggage and Natalya only had a 1/4 ton car. It took a lot of juggling, swearing and Jeff's incredible packing skills and we somehow got everything (including ourselves) into the car and we were off. We arrived at the Renaissance Hotel 6 PM local time. That was 5 AM our time and I had slept less than 2 hours since we left LA over a day ago. I was dizzy with exhaustion. Jeff said we should stay up another few hours so we could get a regular nights sleep. He said if we did that we would sleep through the night, wake up in the morning and be on Russian time. It was a good practical idea he said. I'm sure he said more but I had fallen asleep next to Jeffrey and missed the rest. The problem with going to sleep at 5:30 AM (LA time) is that your body wakes you up in the middle of the day (LA time) and wonders why you are sleeping and why on earth it is pitch black outside. 2:30 AM Russia time and I'm sitting up in bed wide awake. 10 minutes later everyone else was awake too. We turned on the lights and began our day. Which consisted of Jeff sitting at our laptop, Jeffrey watching DVDS on the portable player and me reading the current Harry Potter book for the next 4 hours while we waited for the breakfast buffet to open up. We were the first ones to arrive and we were starving. We hadn't eaten since the last plane ride more than 12 hours before. The food at the buffet was delicious. It definitely had a European flare with several types of fish and Russian pastries. But they also had eggs, French toast, cereal and fruit. I found a pitcher of milk and poured some over my cereal only to be greeted with lumpy, thick keifer. At least it wasn't milk gone bad as I originally thought. After breakfast we went back up to the room and spent the next 2 hours unpacking and getting organized while we waited for our driver to pick us up. When we got down to the lobby, I found Cathy and her daughter waiting for us. It was great to meet her face to face for the first time. When our driver showed up we all ran through the freezing cold and straight into the large van they had provided for us to travel back and forth to the orphanage. There we met Cathy's husband Mike and son Patrick. 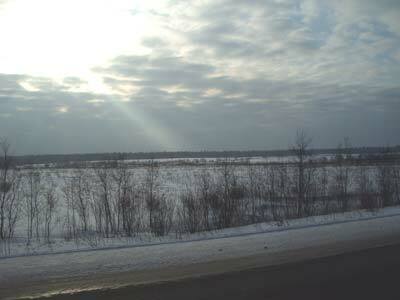 The ride out to the orphanage was 2 hours and through beautiful snow covered countryside. The van was comfortable and afforded lots of good viewing from the big windows. Driving in Russia is always an adventure. We got a little too close to log truck in front of us but by now I was already learning to close my eyes and hope for the best. 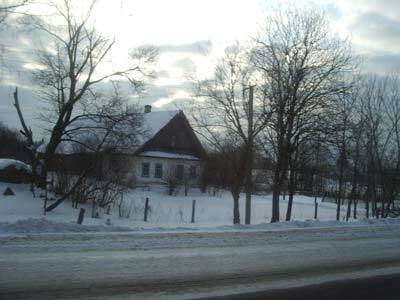 As we got into Kingisepp I took some pictures of the village. When we finally arrived at the orphanage they escorted us into the tiny directors office. Only our translator spoke English. They started with Cathy, telling her all about Viktor. Then they turned to us and began telling us about Katherine (Katya in Russian). Suddenly there was a commotion in the hallway, Cathy looked up and said "OH here they are..."
I couldn't see anything from where I was sitting but I felt myself begin to cry. So much for holding it together. They marched both kids into the room and there she was. My first thought was that she didn't look anything like the picture I had seen and she was so skinny. Like pictures of the kids they show you on the "Feed the Children" commercials. She dutifully walked over to me, turned her back and waited to be picked up. I scooted her up on to my lap and I could feel every rib through her dress. Before I even had a chance to get a good look at her, they took her hand, pulled her off my lap and led her out of the room. They began to apologize right away and said that there was something that had not been written in her files and that we should know about it right away. They said she had been exposed to TB 2 years before and that they understood that it was a serious matter and again were very sorry that we had come all this way without knowing that. They said it would be possible for us to meet another child but they did not want us to see her again if we decided to do that because it would be very hard for her to understand. All this being passed from the director through the translator to us. At first I was surprised but having read about it I knew it was a common occurrence with Eastern European adopted kids and not as big a deal to us in the America. We told them of course we still wanted to meet her and they brought her back into the room where she marched up to me and starting talking very earnestly and pointing at her hair. Natalya laughed and said "she is telling you she wants to grow long hair." Natalya told her I said she could have long hair and she burst into another long string of happy chatter and then spent the next hour and half stringing beads, coloring and playing with some of the toys we brought for her. Soon it was time for us to go, but we told her that we would be back tomorrow. When we arrived next day, they told us we could take the kids out for a walk in the town. They sent along 2 of the older girls from the orphanage next door as our guides. Very sweet girls who were already 16 and past the age that they could be adopted. They gave us a sled for Jeffrey so he didn't have to walk in the snow and we set out to see some sites. Jeffrey prepared for the cold (and this still wasn't warm enough). 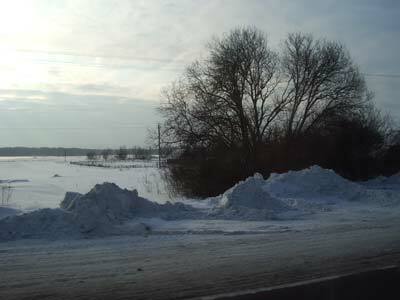 They took us to the top of a hill where the children from the town had created a sledding slope and were careening down the hill on small soggy pieces of cardboard. It was fast, dangerous, life threatening and wet. The kids couldn't wait to do it. Katherine, looking like the little boy from Christmas Story who couldn't put his arms down, was the first to to go flying down the ice slope. She pushed off and went airborne before reconnecting with the ground, flipped over and slid the rest of the way down the hill on her back. Apparently this was the correct way to do it because everyone in the group applauded. Viktor and Jeffrey went next, both becoming airborne before landing on body parts other than their bottoms and arriving at the bottom head first. Much cheering and applause from the crowd. After many runs down the hill it was time to head back. Before we reached the orphanage, Natalya suggested we stop at a cafe for some lunch. It had been almost nine hours since we had eaten so that sounded really good. 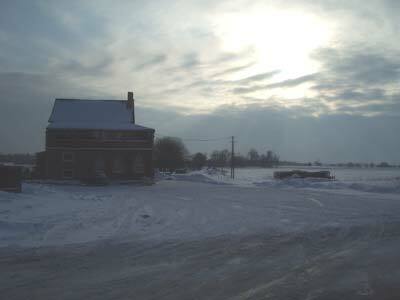 The place we went to was a little hole in the wall with 2 rooms and giant fireplace in the back. Natalya read us the menu and we decided on soup and a sandwich which turned out to be a small piece of bread with a pickle and 2 slices of salami. I liked it better than I thought I would and the soup was fantastic. Natalya ordered the kids a piece of layer cake. It didn't even hit the table before Viktor starting eating. It was gone before Katherine even got hers. When hers arrived she stared at the cake without touching it. We kept saying Eat.. Eat! She would smile but wouldn't touch it. Finally she took a small bite and then the cake was gone in a flash. Natalya told us this was a treat that they never got in the orphanage and it was also the first time for them in a restaurant. I took Katherine to the bathroom while we were there and discovered that bathroom etiquette is quite different in Russia. First there is no toilet seat. Just a cold dirty toilet bottom which she had no trouble perching herself on top of while her hands touched the inside of the rim. ICK ICK! Then of course there is the issue of toilet paper. Most people in Russia don't use it. She looked at me like I was crazy when I tore off a piece of the brown roughage and tried to get her to wipe her under parts with it. I figured we'd work on that later. We spent quite a bit more time sitting around the tables next to the fire talking and laughing. 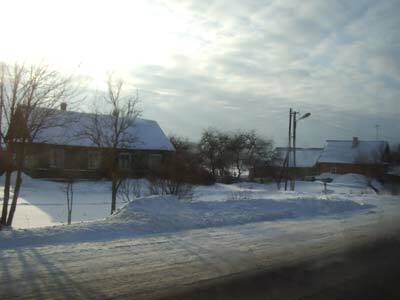 It was very surreal knowing we were 100 miles from anywhere in a small village in Northern Russia. Finally it came time to leave and all too soon we were back in the directors office getting ready to go home. As we were packing our stuff Katherine began to talk to me... chattering on and on in Russian. Natalya said she wanted a picture of us together. The director took a picture with her own camera and printed it out and then we took two with a Polaroid Cathy had brought. Katherine smiled and tucked the pictures into the family photo album I left for her so she could look at pictures of us and our house while we were gone for the next who knew how long. We took a few for ourselves. We had to wake Jeffrey up... can you tell? Suddenly the social worker was there gathering Katherine's things and leading her out of the room. She pulled away and came and looked up at my face and said something very seriously. I looked to Natalya who said "She wants mama to come back... " Tears pooled in my eyes. She smiled and leaned up for a kiss. I leaned down to kiss her and then she went to Jeff and kissed him on the cheek and left. "She certainly has taken to you" Natalya said. I looked up and saw Jeff standing with his back to the group looking out the window with tears trickling down his face. I somehow made it the van, sniffling and wiping my eyes before I completely broke down and cried. The trip back was a blur and I think all of us slept most of the way. The next day we went to the notary to sign the acceptance papers and then stopped at a little retro looking cafe not too far from our hotel. That night I went down to hotel gift shop to get some small souvenirs to bring back for the other kids. The shop was small and filled with some very expensive looking things. But the prices didn't seem overly expensive. As a matter of fact most of them seemed down right reasonable. This is where I like to say all the traveling and time change and stress and lack of sleep all came into play and clouded my otherwise intelligent mind. I walked through the store feeling positively giddy that all the things were priced within reason and chose generously. Several nesting dolls, 2 crystal key chains and a crystal with a beautiful ballerina lazered into the center. I took the things to the counter where the well-dressed lady asked if wanted the total in rubles or euros. Well, rubles I suppose, I mean after all...that's what they were marked in wasn't it? We WERE in Russia so I naturally assumed that all the prices had been marked in rubles. She rang up my purchases and the total came out to 4200 rubles. OH NO.... hang on a second.... 4200? That's, um, let's see. I was desperately trying to do the math in my head but seemed to have lost all ability to think. But unfortunately I hadn't lost enough of the ability because my brain was quickly doing the calculations and coming to an answer that I didn't like very much. It turned out the prices were marked in Euros and Rubles were marked in tiny little print up in the corner of the price tag. Who bothers to read the fine print? The items I thought were $5 each were actually closer to $30. I stuttered and stammered and basically stood there with a stupid look on my face. The lady behind the counter asked if I was OK. I was too embarrassed to tell her my mistake, so I simply handed over my credit card, said Thank You shot out of there before I bought anything else. My little shopping expedition had totaled 150 AMERICAN dollars. You can bet the kids weren't getting their hands on those $50 nesting dolls. I figured I wouldn't say anything to Jeff until he got the bill and by then I was hoping I could think of a better excuse than I couldn't read the price tag. The next morning at 4 AM our driver arrived to pick us up in a black Mercedes sedan and whisked us to the airport through the dark and quiet streets of St Petersburg. I felt like I was in an old spy movie with the mist hanging low along the roads and our driver hunkered down in his seat with his hat pulled down over his eyes. When we got to the airport it was closed. I wasn't aware that entire airports could close, but apparently I don't know everything. It finally opened at 5 AM and after going through a rather questionable security check (which amounted to them asking me if I had any weapons, taking my word for it and waving me on) we boarded our plane and were on our way home. We stopped in Frankfurt where they confiscated my nail clippers. Everyone also got a huge kick out of the fact that our last name is Zucker which means Sugar in German. I began to humor them by acting surprised and laughing along. It had to be a better reaction then shouting "YES I KNOW... Everyone in the freakin' airport has told me that already!". I guess it was good they took my nail clippers. Who knows what I might have done. From there we flew on to Detroit where we went through customs and then had some time to eat and relax for about an hour. I took Jeffrey to the food court while Jeff made some phone calls now that our cel phones worked again. I came back with sandwiches, cookies and drinks. Jeff was looking out the window quietly. "So did you get in touch with everyone?" He turned to look at me with tears in his eye. I knew immediately that he meant his father had passed away. We had been keeping in contact with his mom and uncle via e-mail during the time we were gone and knew things looked very bad. I'm sorry was all I could manage to say. I looked around us. 100's of people milling around, some trying to get seats, some talking and laughing. Completely unaware of what we were feeling. I couldn't bring myself to let go and cry. Jeff looked at me and I looked at him and we hugged and tried to shut out the world for just a moment. They called us for boarding and we got swept up in the mass of people and before we knew it we were taking off on our last plane ride home. I got a beautiful shot out the window as we were flying and imagined Pa-pa Teddy out there waving and telling me everything was going to be OK.